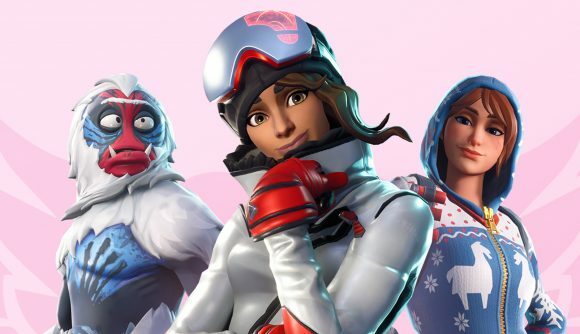 Fortnite is getting romantic this month in the Share the Love event. The event starts tomorrow and lasts until the end of the month and the start of Season 8. In addition to new challenges and cosmetics, the event brings double XP weekends, a bunch of Fortnite Creative highlights, a new competitive series, and bonus rewards for participating in the Support-a-Creator programme. You can get into a new set of Overtime Challenges when the event starts on February 8, which will give you a bit of extra stuff to do ahead of the delayed Season 8 release date on February 28. These challenges will get you five new rewards, including the Valentine Wrap and Vines Contrail. Battle Pass owners will additionally be able to get new styles for Trog, Powder, and Onesie outfits. On top of that, you’ll have double XP weekends on February 15-17 and 22-24 if you need some help finishing out that battle pass. You’re also going to see what Epic is calling a ‘Featured Island Frenzy’ – new Fortnite Creative islands rotating every single day from February 12-22. If all that lovey-dovey stuff is off-putting, you can also get yourself into a fresh competitive series as part of the event. Placement matches start on February 9 and 10, and daily competition will run simultaneously in open, prospect, contender, and champion divisions. If you progress to that last tier and earn a pin, you’ll get a spot in the finals on February 23 and 24. Share the Love concludes on February 27, immediately before Season 8 begins, and you can find more details on the official site. Check out the Paradise Palms shooting gallery location or Expedition Outposts locations if you need some help clearing out those last few challenges. With an extra couple of weeks on the battle pass this time around, there’s nothing holding you back.